Disney Parks are working hard to simplify the guest experience, and will be rolling out a collection of new features over the next several months called MyMagic+. With this new collection of tools, guests will be able to plan their vacations in advance while making their visit to the parks as easy as possible. One of the biggest features of this new technology is the My Disney Experience website and mobile app. Whether you want to plan your entire vacation in advance or plan to let the day unfold spontaneously, this website and app makes it easy to book dining reservations, ride times, show viewings and more through the innovative Fastpass+ system. Once guests arrive at the parks, they can use their smartphones to change their plans on a whim. 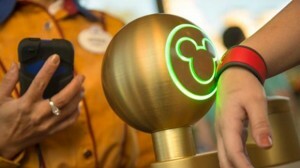 Another integral part of these new tools are the MagicBand, which Disney has been developing for some time. This new band will serve as your theme park ticket, hotel key card, Fastpass+ account, PhotoPass and function as a payment account if you choose. While some of the features of MyMagic+ have already been tested, Disney plans to continue testing, adjusting and adding new features based on guest feedback and other criteria. What do you think of this new service?